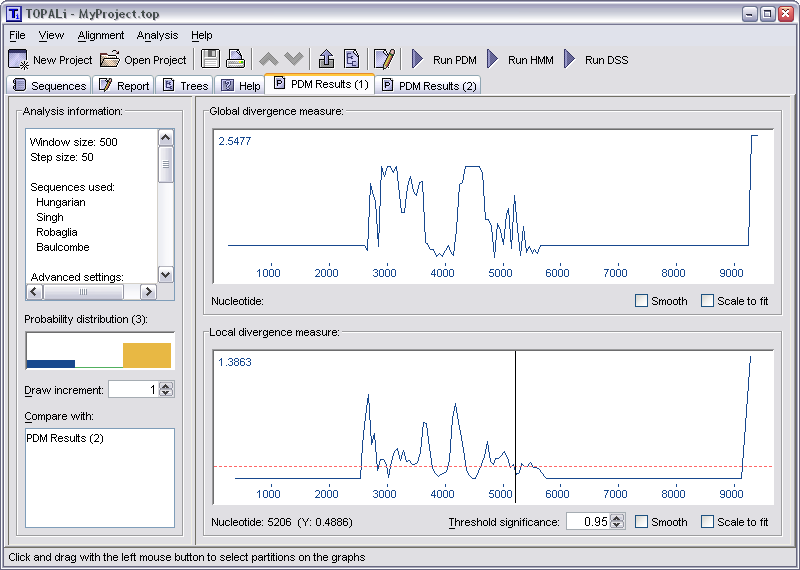 TOPALi provides an intuitive graphical interface for working with existing statistical methods designed for detecting recombination in DNA sequence alignments. 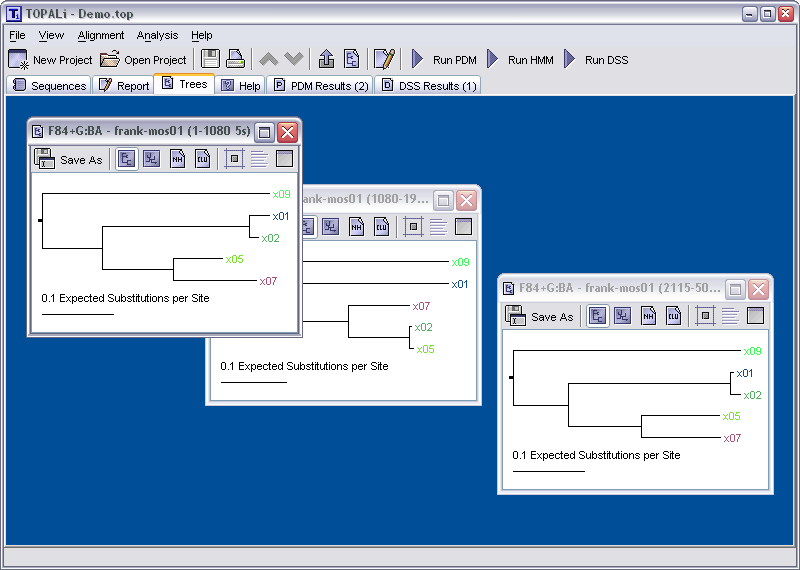 Once recombinant regions have been identified, further (automated if desired) analysis is then possible, including the creation of Phylogenetic trees, mosaic structure predictions, and HTML report generation. TOPALi has now been superceded by TOPALi v2. Click here for details. You can also view TOPALi's online help for more information on what is available. TOPALi is written in (and requires) Java, and should work on any platform that supports Java 1.4.1 or later. 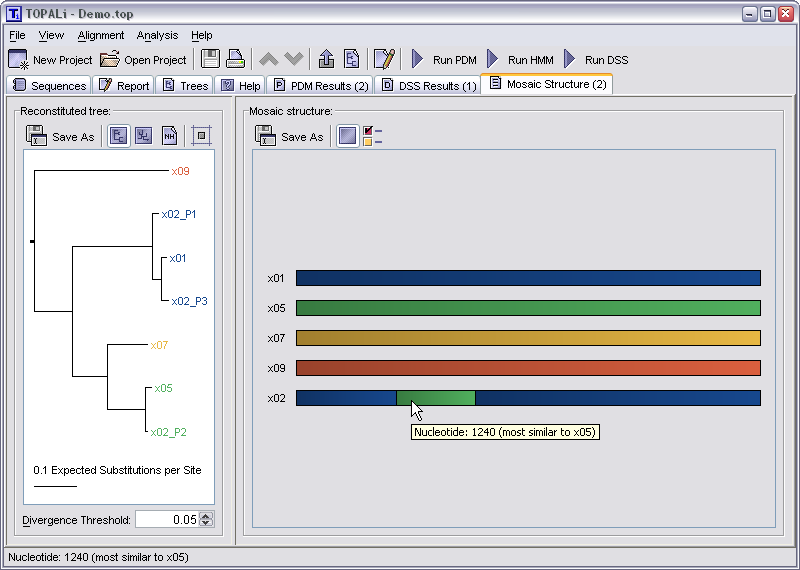 Note however, that its analysis methods work by calling external C++ programs. These have currently been compiled and tested on Windows, Unix (Solaris) and Linux (RH 8 and 9 & Fedora). It may be possible to compile some or all of them (and hence use those methods within TOPALi) on other platforms, but we cannot offer any support for this as we have no way of testing this ourselves. 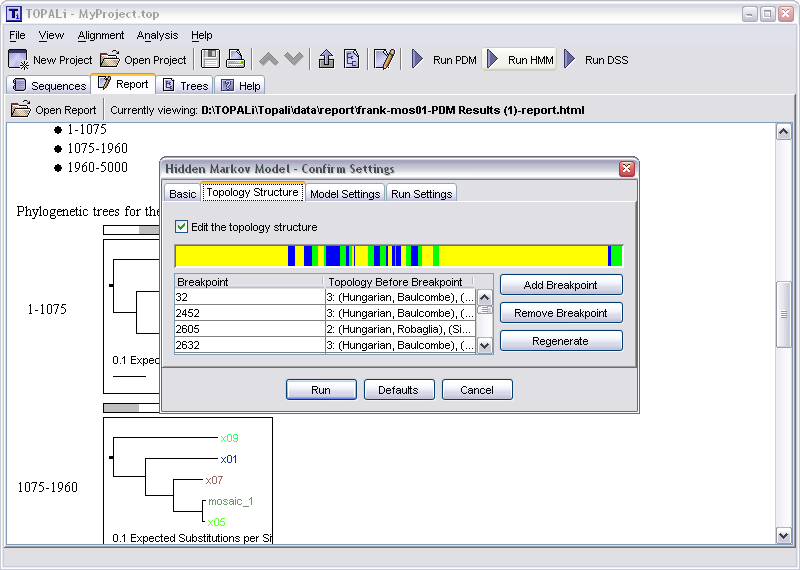 (TOPALi is released under the GNU General Public License. See here for further information on this and the licenses for TOPALi's helper applications). 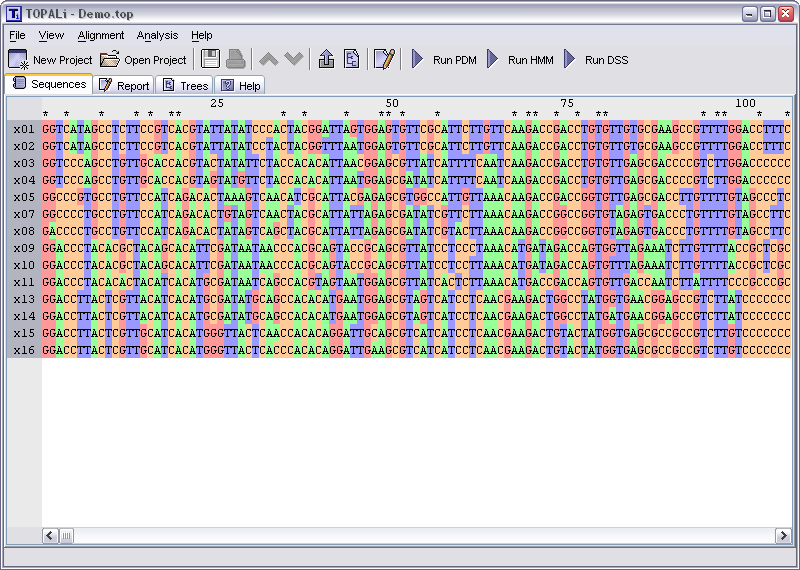 Milne I, Wright F, Rowe G, Marshal DF, Husmeier D and McGuire G (2004), TOPALi: Software for Automatic Identification of Recombinant Sequences within DNA Multiple Alignments, Bioinformatics 20 (11), 1806-1807. View PDF. Husmeier D and McGuire G (2003), Detecting Recombination in 4-Taxa DNA Sequence Alignments with Bayesian Hidden Markov Models and Markov Chain Monte Carlo, Molecular Biology and Evolution 20 (3), 315-337. 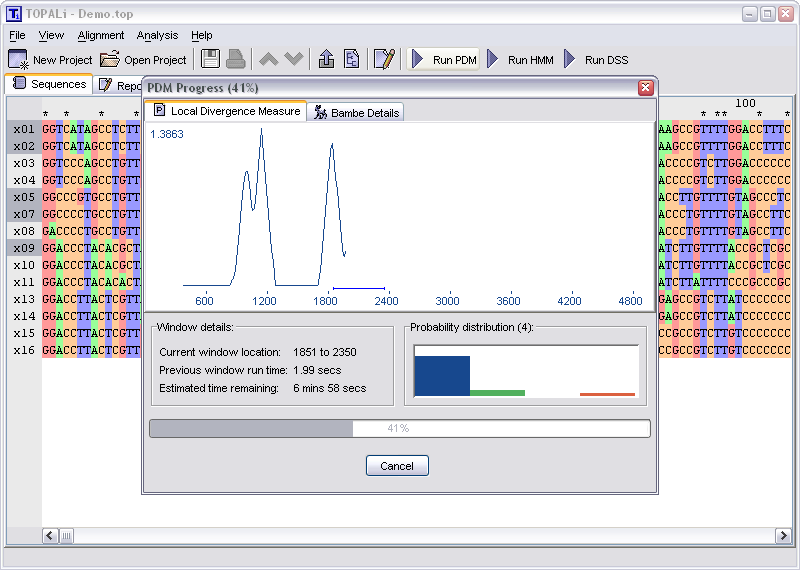 Husmeier D and Wright F (2001), Probabilistic Divergence Measures for Detecting Interspecies Recombination, Bioinformatics 17, Suppl. 1, S123-S131. McGuire G and Wright F (2000) TOPAL 2.0: Improved Detection of Mosaic Sequences within Multiple Alignments, Bioinformatics, 16 (2), 130-134. Please do not hesitate to contact us at topali (at) bioss.ac.uk if you have any further queries or comments about this software.